“Is it possible to have a good life without wasting too much?” That is the question Colin Beavan poses in the new documentary, No Impact Man, a film that probes the neglectfulness of America and our ignorance to the harm we are causing our planet through the millions of carbon footprints we produce each day. Beavan, along with his wife Michelle and daughter Isabella, set out on an environmental experiment to see if it is possible to live a sustainable life in New York City without making any negative impact on the environment. Though few of us could survive without television, computers or video games, they lived for one year without toilet paper, incandescent light bulbs, magazines, newspapers, elevators, plastic bags or any form of motorized transportation. Is that a tad extreme? Absolutely. Is it a little naïve to think that their actions could influence an entire city, or even the world into significantly cutting back on their carbon emissions? Perhaps. But it is also brave and noble, shunning the things they have become accustomed to and trying to lessen their impact on the environment while also providing a habitable home for themselves. 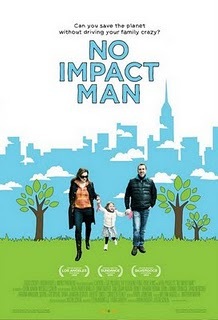 What No Impact Man does so successfully is condense a year’s long worth of character growth into a short 90 minutes, showing the evolution of Colin and Michelle’s personal thoughts and beliefs through that time. Initially (and understandably), Michelle is reluctant to undertake this venture, quickly feeling the jolts from her coffee and fast food withdrawal, while Colin finds the whole affair easy, but as time goes on, their roles begin to flip. After getting numerous letters from other environmentalists, heartlessly explaining how “crazy” people like him give them a bad name, Colin begins to doubt his actions, questioning if what he is doing is relevant, and it is Michelle who puts life back into perspective for him. Colin admits about his experiment, “It’s not meant to be scientific,” because it is far from it, but the end results say more than any scientific data. Over the course of the year, Colin and Michelle do indeed become better parents to young Isabella, spending more time with her and partaking in activities outside, not confined to the four walls of their living room and refusing to let the television baby-sit their child. They all become healthier, quitting their bad dietary habits and getting plenty of exercise through their use of bicycles as their means for transportation. They even save more money by buying only food and necessary equipment. The impact on the environment may be strangely absent, but the impact in the home is ever present. In the end, Colin realizes that being a good environmentalist is not about reducing your carbon footprints to zero, but rather managing them in sustainable ways. This revelation is a test for the viewer, challenging us to look at the negative effects we are having on the environment through things that are not vital to our well being. Is No Impact Man really going to change how we live? No, of course not. But it will make you think twice the next time you step on that elevator.